Take your productivity to the next level and make the most of your time! Do you have too much to do and not enough time to do it? Don't we all! Productivity For Dummies shows you how to overcome this common problem by tackling key issues that are preventing you from remaining focused and making the most of your time. This insightful text gets to the root of the problem, and shows you how to identify and analyse the items on your to-do list to deliver on deadlines and maximise your schedule. Numerous techniques and technologies have been developed to address productivity needs, and this resource shows you which will work for your situation. Productivity is crucial to your success - whether you want to find a new job, earn a promotion you've had your eye on, or generally progress in your career, understanding how to improve your productivity is essential in increasing the value you bring to your organisation. At the very least, increased productivity means that you get things done faster—which translates into fewer overtime hours and more time concentrating on the things that are most important to you. 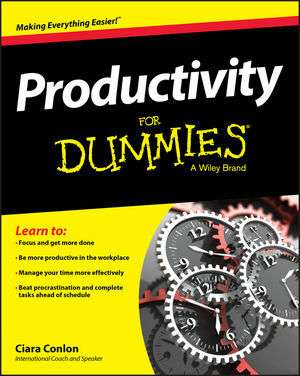 Productivity For Dummies helps you solve the age-old problem of having too much to do and not enough time to do it.